We have centers time every day. Some teachers call it choice time, or free play, but I call it centers time because my room is organized into centers. Each day we have a brief centers time meeting, during which I explain what will be available at each center that day. 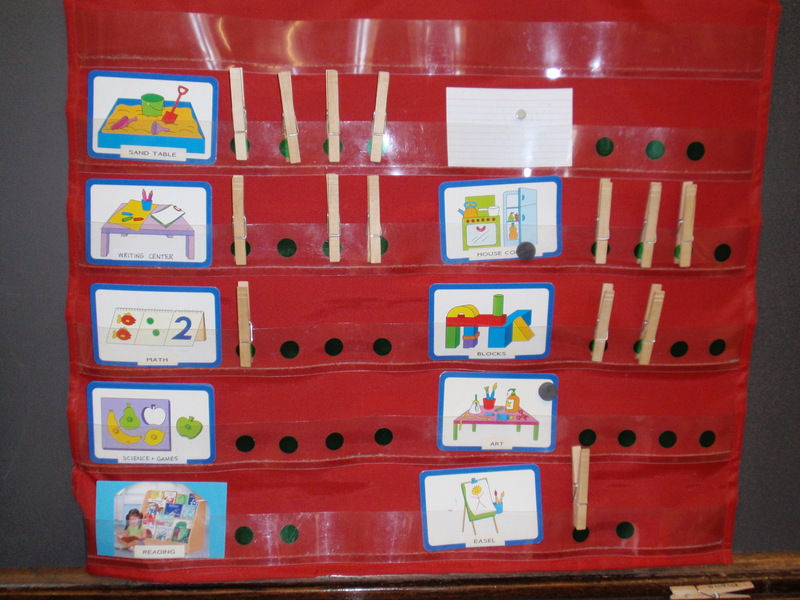 Sometimes I put samples of centers time activities into a green basket under my chair, and bring it out to show the children what is available and how you use it. Then I draw clothespins one at a time out of a bag. 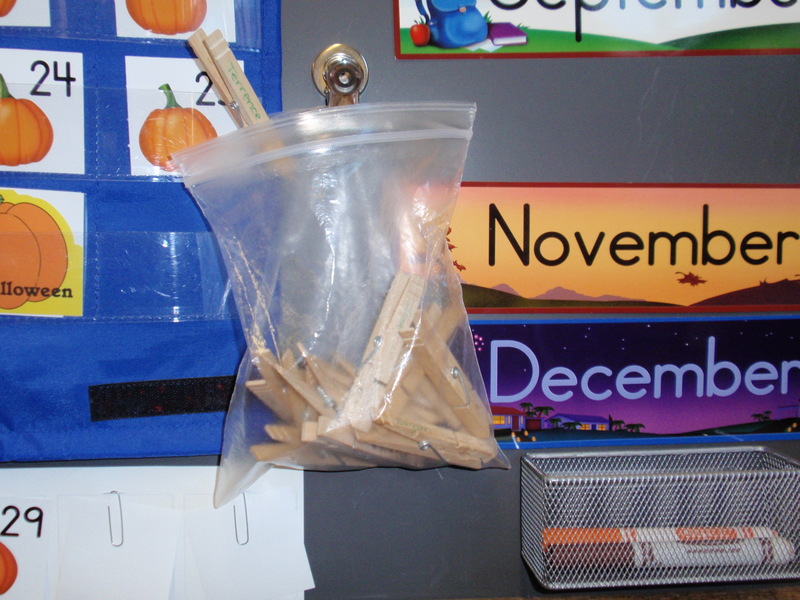 Then I draw the first clothespin and read out the name that is written on it. “Lola,” I might say, “where would you like to work today?” Lola stands up and walks over to me and says, with great seriousness, “house corner,” so I hand her the clothespin and she walks over to our centers time pocket chart and clips her clothespin on one of the green dots next to the house corner card. You may switch centers whenever you want, although if you switch too often a teacher is going to ask you to pick one thing and stick with it for a while. Every center has a limit to how many children can be in it at once. Most centers have a limit of four. There are green dots on the sticker chart to indicate the spaces available. Once all the stickers are covered, that center is full. You must never move someone else’s clothespin. You need to clean up after yourself before you switch to a new center. At the five minute warning, it becomes too late to switch. For the last five minutes everyone stays where they are and finishes the work they are doing there. Thank you for posting this. This is exactly what we were doing except using name tags instead of clothespins. I am not sure what they aren’t getting, if the activities aren’t exciting enough, something is different about this class. I sometimes wonder if it’s me this year, too many outside things coming inside to the classroom.